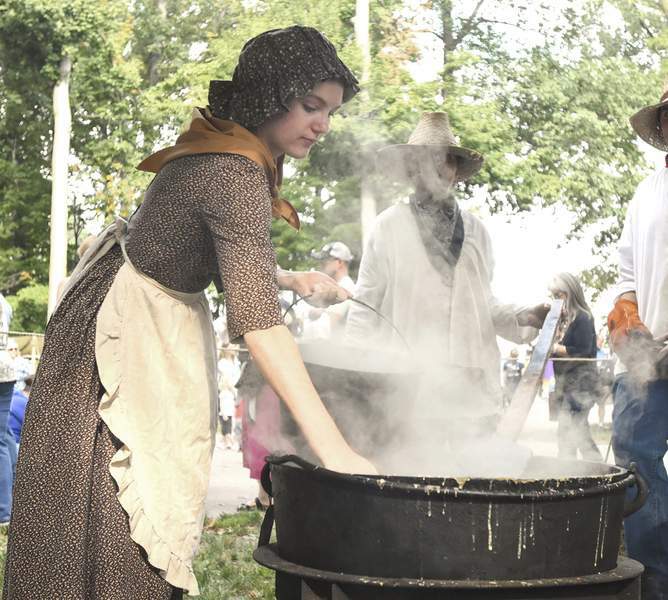 File photos The Johnny Appleseed Festival happens Saturday and Sunday at Johnny Appleseed Park, featuring period re-enactors, artists and music. 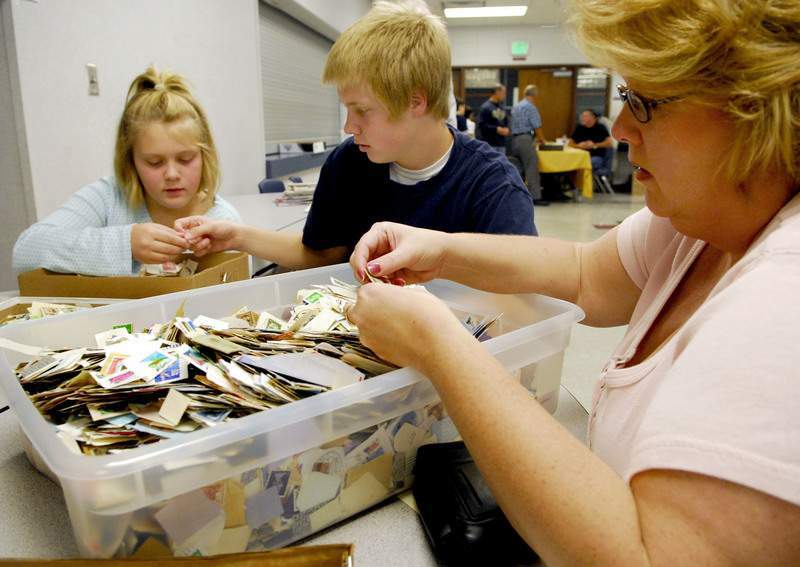 The Anthony Wayne Stamp Society will host its Anthony Wayne Philatelic Exhibition Saturday and Sunday at the History Center. 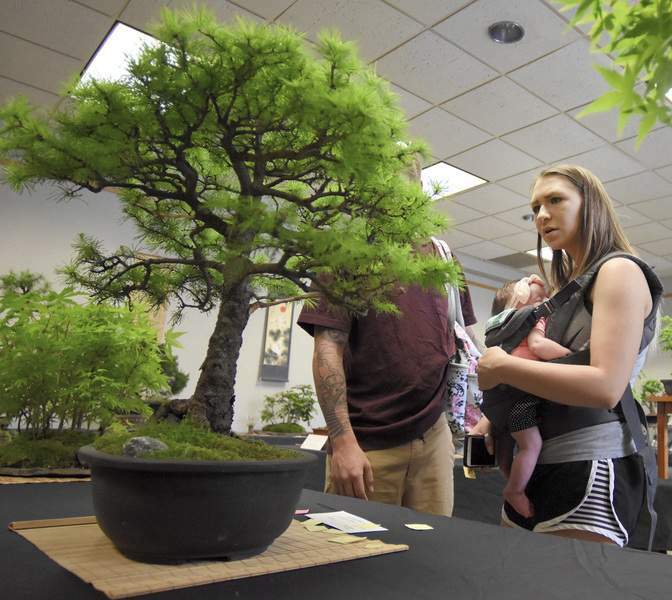 The Fall Bonsai Display happens Saturday at the Foellinger-Freimann Botanical Conservatory. Star Party on the Riverfront – 9 p.m.; hosted by Riverfront Fort Wayne with Fort Wayne Astronomical Society; Lawton Park, Clinton and Fourth streets; free. Kasper Nelson – With Chris Young; 7:15 p.m.; Fort Wayne Comedy Club, 2104 S. Calhoun St.; $15 advance, $20 day of show; www.fortwaynecomedyclub.com. Legion Dance – Justus III; 7 p.m.; American Legion Post 296, 130 W. Tillman Road; $5; open to public; 456-2988. Contra Dance – Sponsored by the Fort Wayne Traditional Music and Dance Society; 8 to 11 p.m., lessons at 7:30 p.m.; Fort Wayne Dance Collective, 437 E. Berry St.; $9 general public, $6 students, free for ages 12 and younger; 260-244-1905. Middle Waves Festival – Music festival; 5:45 to 11:15 p.m. today and 1 to 11:15 p.m. Saturday; Headwaters Park, 333 S. Clinton St.; for lineup, tickets and information, go to www.middlewaves.com. Ossian Days – 5 to 10 p.m. today and 7 a.m. to 10 p.m. Saturday; downtown Ossian; for more information on activities and times, go to www.ossiandays.com. Johnny Appleseed Festival – 10 a.m. to 6 p.m. Saturday and 10 a.m. to 5 p.m. Sunday; Johnny Appleseed Park, off of Coliseum Boulevard near Memorial Coliseum; free admission; johnnyappleseedfest.com. Foellinger-Freimann Botanical Conservatory – “Art of the Garden: Daniel Dienelt at the Conservatory,” ends Nov. 11; 1100 S. Calhoun St.; $5 adults, $3 ages 3-17, free ages 2 and younger; hours, 427-6440 or www.fortwayneparks.org. “Lindy McCormick: Alcohol Inks, Acrylic, Collage, Sculptures, 3-D Pieces,” through Oct. 31; artist reception from 1 to 3 p.m. Sunday. Fall Bonsai Display from 10 a.m. to 3 p.m. Saturday. Science Central – Closed today for fall shutdown; also, AWS Special Abilities Day from 10 a.m. to 4 p.m. Tuesday and will be closed to the public; live honeybee hive on display; 1950 N. Clinton St.; $9 ages 3-64, $8 ages 65 and older, free members and 2 and younger; hours, 424-2400 or www.sciencecentral.org. Black Pine Animal Sanctuary – 10 a.m. to 3 p.m. Saturdays and Sundays, or by appointment weekdays, including behind-the-scenes private tours, field trips and group tours; 1426 W. 300 N., Albion; $10, ages 10-54, $8, 55 and older, $7 ages, 3-9, and free, ages 2 and younger; program fees vary; 260-636-7383 or www.bpvisit.org; through October. Gene Stratton-Porter State Historic Site – Nearly 150 acres of lake shore, formal gardens, woods and newly restored wetlands and prairies; 1205 Pleasant Point, Rome City; 10 a.m. to 4 p.m. Tuesday through Saturday and 1 to 5 p.m. Sundays; www.genestratton-porter.com; closes for season Dec. 1. Swiss Heritage Village and Museum – 1800s outdoor village and indoor museum; 10 a.m. to 4 p.m. Monday through Saturday; 1200 Swiss Way, Berne; admission, www.swissheritage.org; closes for season Oct. 31. Early Ford V-8 Foundation Museum – On display, 1932 Ford chassis; 2181 General Doolittle Drive, Auburn; hours, 260-927-8022 or www.fordv8foundation.org. On exhibit, donated Lincoln-Zephyr Continental Cabriolet. “Apple Week” – Ends Sept. 22; Sauder Village, 22611 Ohio 2, Archbold, Ohio; $17 adults, $11 ages 6-16, free ages 5 and younger; hours, 1-800-590-9755 or www.saudervillage.org. Walkathon, Color Run and Family Fun Day – Hosted by CPC Women's Health Resource; 8 a.m. registration for color run and 8:30 a.m. race; 9 a.m. registration for walkathon; MacDonald Ruff Arena, 600 Town Line Road, Bryan, Ohio; events.cpcnwo.org/events. Trek the Trails – 6 p.m.; 7-mile bike ride; Ice Way Trailhead, meet at the parking lot just south of SportOne Parkview Fieldhouse, 3946 Ice Way; free; www.cityoffortwayne.org/trekthetrails. Firsthand Fest – 6 to 9 p.m.; featuring stories from people who have firsthand experiences with environmental problems and solutions; Merry Lea Environmental Learning Center of Goshen College, Wolf Lake; $10 registration fee; www.goshen.edu/merrylea. “I'll Take Gatsby” – 6:30 to 8 p.m.; 1920s event; Williams County Public Library, 107 East High St., Bryan, Ohio; $20; for tickets, call 419-636-6734, ext. 275. Johnnie Mae Farm Stand – 4 to 7 p.m.; Renaissance Pointe Neighborhood, 2518 Winter St.; hosted by Fort Wayne's Office of Housing and Neighborhood Services; through October. Historic West Main Street Farmers Market – 3 to 8 p.m.; 1936 W. Main St.; operated by the Nebraska Neighborhood Association; through October. Antique Outboard Motor Club – 10 a.m.; North Webster Community Park, North Webster; free. “Canelo Alvarez vs. Gennady Golovkin” – Boxing match; 8 p.m.; Regal Cinemas, Coldwater Crossing 14, 211 W. Washington Center Road; tickets, fathomevents.com. “Dragon Ball Z: Broly – The Legendary Super Saiyan” – Film screening; 12:55 p.m.; Regal Cinemas, Coldwater Crossing 14, 211 W. Washington Center Road; tickets, fathomevents.com. YLNI Farmers Market – 9 a.m. to 1 p.m.; corner of Wayne and Barr streets; ends Sept. 29. Fort Wayne Food Tours – 3 p.m.; downtown food and history walking tours; $60; www.fortwaynefoodtours.com; ends mid-October. Wabash Farmers Market – 8 a.m. to noon; downtown Wabash; ends Oct. 20. Anthony Wayne Philatelic Exhibition – Hosted by the Anthony Wayne Stamp Society; 10 a.m. to 5 p.m. Saturday and 10 a.m. to 3 p.m. Sunday; History Center, 302 E. Berry St.; free. Riverfront Boat Tours – 3, 5, 6:15 and 7:30 p.m.; offered by Riverfront Fort Wayne; boat departs from Guldlin Park or Headwaters Park; $12 per person; reservations, 427-6000 or www.fortwayneparks.org; through September. “Rushmore Live” – Featuring historical interpreters of the monumental figures on Mount Rushmore; 7 p.m.; Huntington University, Zurcher Auditorium, Huntington; free. “Dragon Ball Z: Broly – The Legendary Super Saiyan” – Film screening; 7 p.m.; Regal Cinemas, Coldwater Crossing 14, 211 W. Washington Center Road; tickets, fathomevents.com. “Rock of Ages” – Fort Wayne Civic Theatre; 8 p.m. today and Saturday and 2 p.m. Sunday; Arts United Center, 303 E. Main St.; $30 adults, $25 seniors and $17 for ages 23 and younger; fwcivic.org or 424-5220; ends Sept. 23. “Present Laughter” – First Presbyterian Theater; 7:30 p.m.; 300 W. Wayne St.; $20 general admission, $18 seniors 65 and older, free for the first 30 full-time students with reservation, $10 otherwise; 426-7421, ext. 121, or www.firstpresbyteriantheater.com; ends Sept. 22. “Nunsense: The Mega-Musical” – Van Wert Civic Theatre; 8 p.m.; 118 S. Race St., Van Wert, Ohio; $15; ends Sept. 30; vwct.org or 419-238-9689.